LA based DJ Prophet, holds it down blending old school hiphop with modern tracks at weekly residencies in Hollywood & DTLA, check him out at SuperSoul Mondays in Hollywood at JJ's Los Angeles, Thursdays at The Falls Lounge in DTLA for #GoodTimes and Saturdays at The Woods Lounge in Hollywood. Need an incredible host or soundtrack for your party? 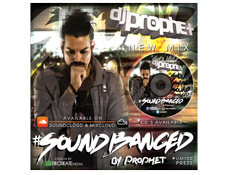 There ain't a party that he can't fix, when DJ Prophet is in the mix!